company details and select a business bank account (optional). details and our staff will then submit your company for incorporation. Quality Formations process the majority of applications within the advertised 3 to 6 working hours; however, as this is dependent on Companies House workloads, we cannot always guarantee this timescale. If you wish to ensure a speedy registration, you can take advantage of the express service to fast track your application and guarantee your company is registered before the close of business today. Please note: We must receive your submission no later than 3.00pm (UK) for it to qualify for the guaranteed same day service. The Registered Office will appear on public record as the official address of your company. With this service, our prestigious Covent Garden address will appear on public record rather than your home address. This service includes the scanning and emailing of all official government mail addressed to your company from a number of official government bodies, free of charge. This service is renewable on a 12-monthly basis at the cost of £39.00 +VAT. Please note: The forwarding of official registered office mail by scan and email is free. Mail will be forwarded on a daily basis. All company directors, shareholders who are persons with significant control (PSC), and company secretaries, must provide a service address where official government mail from government bodies such as Companies House and HMRC can be sent to them personally. This address will appear on public record, so most people prefer not to use their home address for this purpose. With this facility, our London Service Address will show on the public record rather than your home address. This service includes the scanned and emailing of all official government mail addressed to a company officer from a number of government bodies, at free of charge. This item provides a service address for 1 person and is renewable on a 12-monthly basis at a cost of £26.00 +VAT. Please note: Forwarding of service address mail by scan and email is free of charge. Mail will be forwarded on a daily basis. Quality Company Formations' London business address service allows you to use our prestigious Covent Garden address for your day-to-day business correspondence. A business address in the heart of London’s West End is an excellent way to enhance the corporate image of your company and establish a business presence in an important commercial area. All mail addressed to your company will be forwarded to you at an address of your choice by first class post, daily. This service is renewable on a 12-monthly basis at the cost of £96.00 +VAT. Please note: The forwarding of mail to you is not included. All mail forwarding will be charged at Royal Mail postal rates plus 15%. Allow our highly trained staff to handle the formalities of your VAT registration. If your turnover is expected to exceed £85,000 in the next 12 months, it is a legal requirement to register for VAT, unless the supplies are exempt. The ability to claim back VAT on goods and services purchased by the company. Raise the corporate image of the company, by appearing to be bigger than you actually are. Enable deals with suppliers and customers who are not willing to deal with companies that are not VAT registered. If you have employees or directors who will be taking a salary from your company, it is a legal requirement to register for PAYE with HMRC. Failure to register promptly can result in penalties, so why not let our highly trained staff take care of this for you to ensure everything is processed correctly. Accountancy services for start ups and small businesses - free consultation included. Within 48 hours of your company being incorporated, Haines Watts will contact you to arrange a free consultation, which can be in person, by telephone or skype. The purpose of the consultation is to introduce their services to you and also provide you with an opportunity to obtain some free advice on tax and accounting. Haines Watts have developed affordable accountancy products for micro and small businesses, which also include the free use of Kashflow accountancy software. We will provide you with your own unique 020 London or regional telephone number. You can use this number as your new business number on your company stationery, website, advertising, etc., and we will forward all calls to your mobile or landline handset for you to answer. Call forwarding will be charged at BT Standard Rates. Your service will automatically renew every month at a cost of £6.99 plus VAT. Never miss another sales call, with our exceptional telephone answering service! We will provide you with your own unique 020 London or regional telephone number. You can use this number as your new business number on your company stationery, website, advertising, etc., or you can simply use this number to divert your calls to your new receptionists. Your business calls will be professionally answered in your company name by our highly trained reception staff, during the hours of 8.30am - 5.30pm, Monday – Friday. After a call has been answered, you have the choice of the receptionist transferring and announcing the call to you personally, or alternatively a message can be sent to you free of charge - by SMS or email. Please contact us at any time to change your call handling instructions – free of charge. This package includes a London or regional landline number, 30 calls answered per month, with free messaging. Call forwarding is charged at BT Standard Rates. Additional calls answered will be charged at £0.45 per call. Your service will automatically renew every month at a cost of £19.99 plus VAT. This valuable package provides all the guidance and templates your company needs to quickly and inexpensively become fully GDPR compliant. In May 2018, the UK introduced new legislation based on the EU’s General Data Protection Regulation (GDPR), governing how companies collect, process and store data. GDPR significantly increases the responsibilities all companies have when it comes to handling customer and employee data. Breaches of GDPR can lead to very large fines. Avoid hours of research and fines by using our GDPR guidance and template documents contained within this comprehensive package. With our customised Company Seal you can emboss all official paperwork with your company name and registration number. 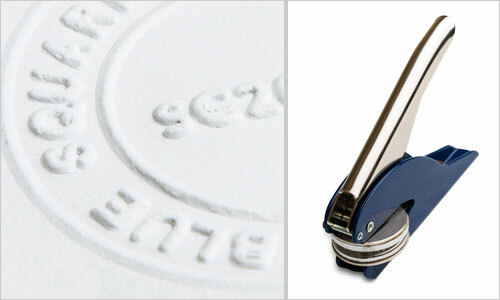 The company seal has a hand plier design and comes complete with its own protective wallet. Please note: The postage of company seals within the UK is free. Postage outside the UK will be charged at Royal Mail postal rates plus 15%. A quality hardback loose leaf folder, with a full selection of company registers and spare share certificates, is ideal for maintaining and organising your company's statutory books. Please note: The postage of company registers within the UK is free. Posting of company registers outside the UK will be charged at Royal Mail postal rates plus 15%. It is a legal requirement for every limited company to submit a Confirmation Statement to Companies House, informing them of any changes to company details. Our highly trained staff will prepare your Confirmation Statement and file it with Companies House before the deadline, ensuring it is completed on time and with complete accuracy. Please note: This service is renewable every 12 months for a cost of £34.99 +VAT. If you are a non-UK resident opening a UK limited company, you may need your company documents legalised before they can be used overseas for certain purposes; such as opening a business bank account. An Apostille Certificate is a form of authentication which can be attached to official UK documents to allow their use in other countries. This official authentication will ensure the documents are verified for use in all countries which are party to the 1961 Hague Convention. Our Apostille service can be used to legalise various company documents, including your Certificate of Incorporation, Memorandum & Articles of Association and Share Certificates. You may also specify additional documents, as required, during the ordering process. Documents which are not filed at Companies House or existing signed documents, will need to be provided by you. Please note: Documents can take up to 14 days to be certified. The cost of £89.99 plus VAT is for one document to be apostilled. Open a Barclays business bank account with one of our company formation packages and get £50 cashback. If you wish to open a business bank account with up to 2 years free banking, we can forward your application directly to the bank as part of your company formation order. An advisor from Barclays will then contact you within 48 hours to arrange a meeting to finalise the opening of the account. Login to your customer area on our website. Select 'orders' tab, then select 'claim cashback'. Tell us where the cashback cheque should be sent and submit the request to us. Once Barclays has updated our system (it may take between 2 to 6 weeks), we will send you a cheque for £50. Cashback must be claimed within 90 days of your account opening. Open a Lloyds business bank account with one of our company formation packages and get £50 cashback. If you wish to open a business bank account with up to 2 years free banking, we can forward your application directly to the bank as part of your company formation order. An advisor from Lloyds will then contact you within 48 hours to arrange a meeting to finalise the opening of the account. Once Lloyds has updated our system (it may take between 2 to 6 weeks), we will send you a cheque for £50. We will provide you with a 020 London or regional telephone number of your choice. This can be used to divert all calls to your own landline or mobile number. Setting up a call divert is simple and can be done on any handset! Our team will be on hand to guide you through this process. Calls are unlimited and there are no hidden fees or costs. This package includes a London 020 or regional landline number, 30nr calls answered per month, with free messaging. Call forwarding is charged at BT standard rates. Additional calls answered will be charged at £0.45 per call. A quality hardback loose leaf folder with a full selection of company registers and spare share certificates is ideal for maintaining and organising your company's statutory books. Please note: The postage of company registers within the UK is free. Posting of company registers out with the UK will be charged at Royal Mail postal rates plus 15%. Why would I use your Registered Address Service? Protect the privacy of your home with our prestigious London registered office address. This service allows you to maintain the privacy of your home address, as our prestigious Covent Garden, London address will appear on public record as the official address of your company. This service includes the scanning and emailing of all official government mail addressed to your company from a number of official government bodies, free of charge. This service is renewable on a 12 monthly basis at the cost of £39.00 +VAT. It will enable you to keep your home address off the public record at Companies House. It prevents unsolicited mail and visitors from arriving at your private residence. Creates a professional, corporate image as the registered office address requires being displayed on company paperwork and website. Gives the impression of a large, established business. Why would I use your Service Address? Protect the privacy of your home with our prestigious London service address. This service allows you to maintain the privacy of your home address, as our prestigious Covent Garden, London address will appear on public record as the official address of a company officer. This service includes the scanning and emailing of all official government mail addressed to a company officer, from a number of official government bodies, free of charge. This service is renewable on a 12 monthly basis at the cost of £26.00 +VAT. Our London service address will protect the privacy of your home address. It prevents unsolicited mail and visitors from arriving at their private residence. A prestigious London service address will enhance your professional image. Why would I use your WC2 London Business Address Services? A professional business address located in the heart of London can provide a number of benefits for your business - boosting your corporate image and extending your company’s presence. You can use our address as your company’s primary correspondence address, and we will forward all your business mail to an alternative address of your choosing, on a daily basis. This service is renewable on a 12 monthly basis at the cost of £96.00+vat. Creates a professional, corporate image. Provides an alternate contact address from your registered office or home address that is exclusively used for corresponding with clients, suppliers, investors and other third parties. Non-statutory general business mail is delivered to our London address and forwarded to an alternate address of your choice, daily. Please note: This service does not include a registered office service, which should be purchased separately. All general business mail will be handled by us and forwarded to your UK or overseas address for the cost of Royal Mail postal rates plus 15%. As soon as your company is incorporated, we will send you a link to our form by email, asking for some additional information necessary to complete your VAT registration application with HMRC. It is a legal requirement for every limited company to submit a Confirmation Statement (previously called the Annual Return) to Companies House, informing them of any changes to company details. Quality Formations process the majority of applications within the advertised 3 hours, however, as this is dependent on Companies House workloads we cannot always guarantee this timescale. If you wish to ensure a speedy registration, you can take advantage of the express service to fast track your application and guarantee your company is registered before the close of business today. With our customised Company Seal you can emboss all official paperwork with your company name and registration number. The company seal is a hand plier design and comes complete with its own protective wallet. Please note: The postage of company seals within the UK is free. Outwith the UK will be charged at Royal Mail postal rates plus 15%. We have partnered with Haines Watts, one of the UK’s top 20 Chartered Accountant firms who specialise in providing annual accounting and tax services to new businesses. Please note: You should negotiate your fees with them directly. As soon as your company is incorporated, we will send you a link to our form by email, asking for some additional information necessary to complete your PAYE registration application with HMRC. If your first payday is less than 3 weeks away, do not be concerned. You should process your salary or salaries on the date of your first payday and complete your PAYE return when you receive your registration information from HMRC. If your first filing is late, HMRC will take into account the timing of your registration so there should be no issues arising from this filing. With every Company Formation when you open a Free Business Bank Account with Lloyds Bank. Please note: Documents can take up to 14 days to be certified. Our staff will then send your new company application to Companies House for approval. Most companies are registered within 3 to 6 working hours. If you pay for your order and then decide you do not want to proceed, we will return your money in full. Just as long as the company application has not been sent to Companies House for incorporation.